One of the things I intend to do with these Superman Thoughts is to talk at length about the supporting cast of the franchise. As I complained last time, the supporting cast is often the first thing writers cut out to fit in DC Universe Guest Stars and stuff that I don’t care about. 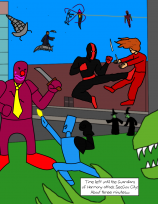 So, if we are going to make the franchise the way I think it should be, getting the supporting cast working correctly is basically my top priority. I’m going to get pretty darn obscure with these later, but not today. Today I am going to talk about possibly the least obscure member of the cast with the obvious exception of Lois Lane. Today I need to talk about Superman’s pal, James Bartholomew Olsen. Jimmy Olsen’s deal is thus: He is a younger coworker of Lois and Clark at the Daily Planet newspaper, and frequently gets caught up in the various adventures and weirdness and Supermanning that happens there. It is hard to believe in today’s comics industry, but this character starred in a series that ran for over a hundred issues. There was a time when Jimmy was considered to potentially star in a television series, and that would have been before even Batman got one. 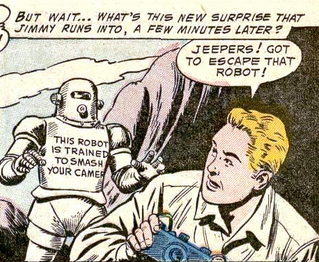 Once upon a time, Jimmy Olsen used to be a big deal. Not lately, though. As far as I can tell, nobody likes poor Jimmy anymore. Even among Superman fans I see on the Internet, Jimmy is mocked as a loser. And, sure enough, he is kind of a putz most of the time. But then, when he isn’t, such as on the currently-running Supergirl, where he is a successful photojournalist (and handsome as heck), a vocal number of people on the Internet saw it as being wrong for the character*. But, as with all things, I think it’s more complicated than people give it credit for. Neither putz nor pro is completely right or wrong for Jimmy. When I read through the entire run of Jimmy Olsen’s comic, I particularly enjoyed the way he changed over the course of the series. In the beginning he’s a kid, kind of a sweet kid, but kind of an idiot. Superman always has to get him out of trouble and teach him lessons in bizarre ways. By the end, Jimmy is a legitimate photojournalist and bonafide action hero in his own right. If we think Superman should be about inspiring people to become better and step up to be good people, Jimmy was, in that era, an in-text example of that happening. I contrasted that with a more modern retelling of Superman’s arrival in Metropolis, I think it was Superman: Secret Origin but it could have been Birthright, in which Jimmy was practically an action hero even before meeting Superman, and read the writer’s thoughts that they wanted to show why people like Jimmy (and Lois) were people Superman could be friends with. I can see that argument for Lois, but I feel like it takes away Jimmy’s most useful role in the franchise. Anyway, Superman can be friends with a chump like Jimmy. He’s Superman, after all. And Jimmy takes that friendship as a motivation toward self-improvement. The problem is, I think, that no status quo in comics will ever again last long enough for that amount of growth to happen naturally. In my dream world, we would have a long-form telling of the Superman story that follows the cast for decades of their lives without interruption, but the odds of that happening aren’t great. So, if we’re only ever going to get glimpses of Jimmy in the process of his journey from chump to champ, I think the writers need to be more conscious of that fact. If you’re telling a tale set early in Superman’s career, let Jimmy be simultaneously a lovable doofus and an unlovable jerk. If your Jimmy has known Superman for longer, let him be on his way to being an actual hero, but not quite there. If you’re writing Jimmy who has been through it all and is now a true hero, you should emphasize how far he’s come, and how much work it was. If I were writing a Jimmy in the middle of his transformation, I think I’d treat him like a Spider-Man type hero (minus the powers and costume, of course). He’s the kind of hero who can and frequently does make mistakes, but maybe we’ll believe he can learn from them, preferably being amusing on the way. Jimmy Olsen, as a character, is about the way he is transformed by being friends with Superman. And I didn’t even really get into why that concept is so appropriate for him. *And let’s be truthful, they were also complaining that he’s black on the show, but that’s not actually a valid concern to me, so I’m not gonna bother with it.